Kevin Smith told the world in 2013 that he was going to work on bringing Clerks 3 to life, but before production begins on that sequel he has one more original story to tell. 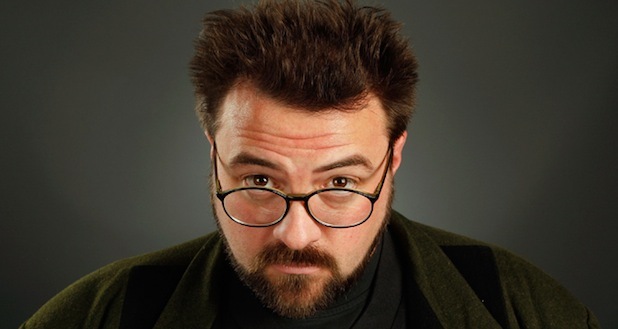 You’ve probably heard by now that Kevin Smith is releasing a new film this fall titled Tusk. The film, which tells the story of a man who is slowly becoming a walrus, is based off a podcast (or Smodcast) which Smith recorded years prior with longtime producer and friend Scott Mosier. Smith has again revisited his bank of podcasts with Mosier for his new feature, Anti-Claus, and today we got our first round of details about the production. Originally titled Comes The Krampus, Anti-Claus was announced today via a story from The Hollywood Reporter. The film will star Justin Long, Haley Joel Osment, Genesis Rodriguez and Michael Parks, all of whom appear also happen to appear in Tusk. Smith originally pitched the film as a holiday-themed horror anthology, but the word ‘anthology’ is nowhere to be found in THR‘s story, so that aspect of the film may have changed. In America, we’re taught that nice kids gets presents from Santa and naughty kids get coal. But in countries like Germany, Austria, Bavaria, Romania and Hungary, Christmas is more metal than merry: Saint Nicholas brings a sack full of toys for good kids and the Krampus carries an empty bag for taking away the bad kids. I wanna see THAT Christmas movie. So rather than wait for it, we’ll make it instead. You can view some concept art detailing how Krampus may appear below. Anti-Claus does not have a release date, but production is set to begin this fall and several sites claim Smith will attempt to sell the picture next month at Cannes’ film market. We’ll bring you more information as soon as details can be confirmed.